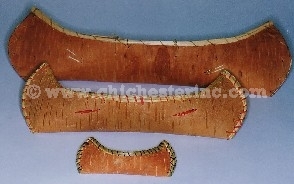 These are real birchbark canoes made by Native Americans in Ontario, Canada. The sizes given below are approximate. Given that they are handmade they can be slightly bigger or smaller and the designs can vary depending on the artist. 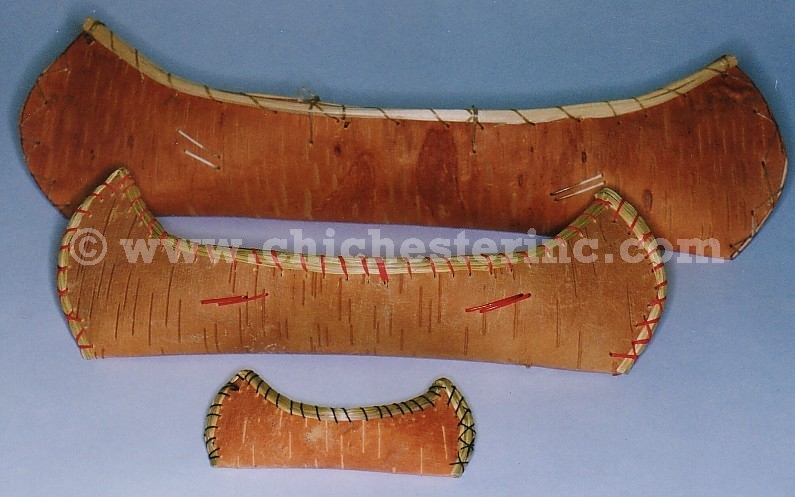 The larger canoes are rimmed with cedar wood, while the smaller canoes are trimmed with sweetgrass. They are either stitched with thread or raffia (usually the smaller ones have thread, and the larger ones have raffia), and most are decorated with dyed porcupine quills. Some smaller canoes may not have quills. 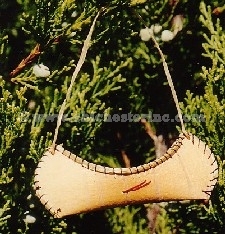 We can also string the birchbark canoes with a hanger for use as holiday or Christmas ornaments. For the ~3" canoe with hanger, it is 3" long, 1" wide and weighs 0.1 oz. (4 grams). The canoes can be lined with plastic and used for floral decorations. To make a stand for your canoe, take two small twigs about 3-4" long. Insert two eye screws into each of the sticks and then use a piece of twine to tie the two sticks together. Set the canoe between the two sticks. The twigs will keep the canoe upright.